For general information about the contest, please see the About and FAQs pages…and please subscribe to the blog to stay current on the contest, regional poetry happenings, and much more! Contestant must be a Whatcom County resident. Contestant may submit only one previously unpublished poem. The poet must be the exclusive author of the submitted original poem. Please limit poems to 27 lines including title and blank lines, with 55 (or fewer) characters per line, including letters, spaces, and punctuation marks. Poems beyond these limits will not be accepted. Poets must submit two (2) copies of the poem. Place your name, street address, phone number, and e-mail address in the upper right-hand corner of one copy only. The second copy of the poem should not be identified in any way other than the title. Students in K-12 must also provide their parent’s name, name of their school, grade level, and teacher’s name (on the one copy with name & address information). Be sure to keep a copy of your poem; poems will not be returned. Entries will be accepted from Friday, March 1, 2019, through 6:00 p.m. Sunday, March 31, 2019. Submissions postmarked before March 1 or after March 31 will be disqualified. Late submissions will be disqualified. Entries may be mailed to: Boynton Poetry Contest, PO Box 1192, Bellingham, WA 98227. OR delivered to: Mindport Exhibits, 210 W. Holly Street, Bellingham, during open hours: Weds-Fri Noon to 6pm, Sat 10am to 5pm, & Sun Noon to 4pm. OR delivered to: Film is Truth, inside Allied Arts Building, 1419 Cornwall Ave., Suite B, Bellingham, from noon to 10pm daily. OR emailed to BoyntonPoetryContest@hotmail.com (Word document preferred; please title document with the title of the poem). Winning poets will be notified by phone or e-mail before the last day of April 2019, and will be invited to read their winning poem at a free public Awards Ceremony on Thursday, May 16, 2019. 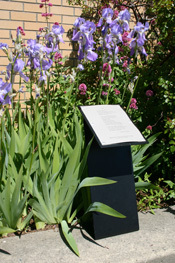 Winning poems will be published in a chapbook collection, as well as displayed on the Sue C. Boynton Poetry Walk outside the Bellingham Public Library and/or inside Whatcom Transportation Authority buses. Winning poems will be presented on thepoetrydepartment.wordpress.com. Contestant grants permission to the Sue C. Boynton Poetry Contest for the poem, the poet’s name, and the poet’s photograph to be displayed or reproduced for publication or fundraising purposes. Click to download the 2019 guidelines (PDF).